OK, so not only bags are "funchico" - here is this awesome, handmade arm sling - refashioned from the a tweed jacket. There is even a little pocket in front for business cards! Read more about how to fashion your own arm sling over at the ReadyMade blog. While I love a new bag as much as the next gal, I'm also THRILLED when a bag is reused or upcycled into something delightful and funchico. Via the stylish blog Shopaholic, I discovered this snazzy pet bed made from an upcycled vintage suitcase. How awesome is that? The Shopaholic blog post lists several accessories for pets that I could definitely see purchasing for our Sharpei EmmyLou - though she might be a tad big for these suitcase beds :) I wonder if she could get behind the linen treat bags. When not providing protection from balaria, dengue fever and other insect-born illnesses, mosquito nets often end up refuse. 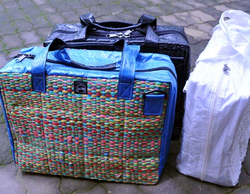 Smateria uses a clever recycling method to make functional, attractive bags. The Drink Carton Wallets (below right) also come almost entirely from trash. Companies using the omnipresent Tetra Pak cartons give secondhand containers directly to Smateria, where they thatch them into durable money-holders. The Plastic Bags are have the most directly re-purposed source material. They take a spectrum of used shopping bags and weave them into far more resilient totes. Smateria employs a workforce of local residents and give equal opportunity to the disadvantaged. Members are fully trained before being given access to equipment and are encouraged to organize and share their own work independently of the aforementioned items. That way everybody wins. I really love the look of the wallets! There are no interior shots of the laptop bag, so you might need a sleeve. But I love it when a company can give back to a local economy as well as do something good for the planet! Let me start by saying that the overall PRESENCE of the Leaf is extraordinary. Not just the appearance of it (which is beautiful) but the entire design aura of the bag. The organic form, inspired by its eponymous "leaf", seems to self-generate positive chi. The refreshing green colour calms my mind and lightens my spirit. The texture delights my fingertips and warms my heart. 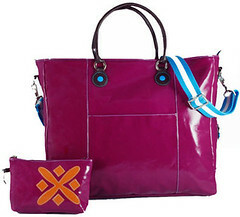 And the vertical orientation of the bag is super-chic. 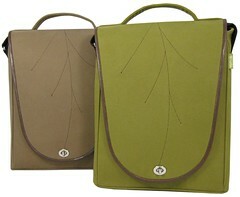 Read the full review of the Leaf Laptop Bag from HER Design.